I am so proud of Marnee, one of my amazing pottery students, who is now branching into reporting. She selected Muddy Rose Pottery for her voice interview and I cannot be more honored!! Marnee's insightful questions showed me she definitely understands the mission at Muddy Rose Pottery. Thank you Marnee for a job well done !!! A huge thank you to Marsha Keefer, Gwen Titley, and Kevin Lorenzi for the beautifully written article and video! "Hopewell Twp. pottery studio transforms more than clay"
"Hopewell woman takes leap of faith to pursue her dream"
*Articles and video courtesy of The Beaver County Times. Welcome To Our Studio Tour! 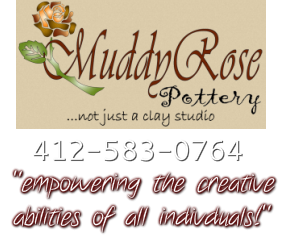 "empowering the creative abilities of all individuals"
Muddy Rose Pottery provides the means for experiencing a stress free, therapeutic journey in clay. Creating a masterpiece on the pottery wheel using one's unique inner vision, equipped with a tool set of hands and fingers, leaves the artist with a sense of pride and gratification. Muddy Rose Pottery is "not just a clay studio." While we welcome all families, groups and organizations, we are dedicated to Individuals with Intellectual and Developmental Disabilites, such as autism. Working in clay promotes communication and socialization and is a calm, soothing approach in providing sensory stimulation. Clay building encourages hand/eye coordination, develops fine motor skills, and encompasses all five senses. Here at Muddy Rose Pottery, we prove that "mud is not just for making beautiful pottery." Call and schedule your visit today, you won't be sorry! Muddy Rose Pottery is blessed to have many wonderful volunteers that help with the day to day operations, our special needs students, the gift gallery, ladies nights, cleanup, glazing, answering phone calls, but most importantly, encouragement and moral support! If you get the chance to encounter one of our lovely volunteers, thank them for their hard work and let them know you appreciate them just as much as we do!